Colombia, Ecuador and Venezuela have avoided war, but now two other Andean nations are gearing up for battle. This time the foe is the United Nations, and the cause is the right to chew coca, the raw material of cocaine. It may not sound as important as the diplomatic row that shook the region earlier this month. But the dispute is momentous for millions of people in Bolivia and Peru  where the coca leaf is sacred to indigenous culture and a tonic of modern life  and for anti-drug officials in the U.S. and other countries who are desperate to stem the relentless flow of cocaine. Says Silvia Rivera, a sociology professor at San Andres University in Bolivia's capital, La Paz, "This is the most aggressive attack [Bolivians] have faced" since the U.N. designated coca a drug in 1961. 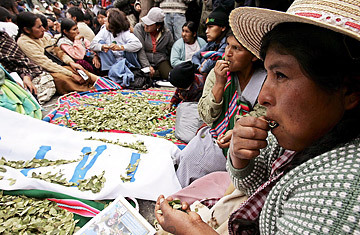 Critics of the report call that conclusion an absurd stretch, especially since there is no published evidence that the coca leaf itself is toxic or addictive. Foremost among the detractors is left-wing Bolivian President Evo Morales, who remains head of one of the country's largest coca-growing unions and was elected as Bolivia's first indigenous head of state in 2005 in part because of his defense of the leaf. "This leaf," Morales said at last year's U.N. General Assembly, holding one up at the podium, "represents... the hope of our people." Bolivia accounts for about 17% of worldwide coca supply and Morales gets much of the international blame for coca's persistence. But while critics like the U.S may call him disingenuous for arguing that coca and cocaine are apples and oranges  analysts say that despite government efforts, much of the coca grown in Bolivia ends up in drug cartels' hands  he has also helped lead what experts like Rivera call "a revaluation of the coca leaf." "Many people," says the sociologist, "have begun to rediscover its nutritional and medicinal benefits." Indeed, several international studies, including one published by Harvard University, say that raw coca is loaded with protein, calcium, iron and a range of vitamins. As a result, Morales has encouraged a local industry, with an eye to exporting, that is turning coca into everything from flour to toothpaste, shampoo and curative lotions. (Morales sent Fidel Castro a coca cake for his 80th birthday last year.) Even as the INCB was issuing its report, the Bolivian government was reaffirming its desire to increase Bolivia's legal coca crop limit from 12,000 hectares (30,000 acres) to 20,000 hectares (49,000 acres). The Bush Administration has warned that the latter move would put Bolivia in violation of its international agreements  it is "not consistent with Bolivia's obligations," said the State Department  and risk tens of millions of dollars in U.S. aid. Seemingly undeterred, Bolivia said this month it was also set to invest another $300,000 for developing new, legal coca markets. Not surprisingly, the Bolivian delegation was the first to issue what it called an "energetic protest" against the INCB's recommendations during the agency's annual meeting this week in Vienna. It also put forward a proposal to remove coca from the U.N.'s narcotics list. That's not likely to happen. The big question is whether the U.N. will adopt the INCB proposal  which would essentially leave Bolivia and Peru in breach of international law if they continue to allow coca's non-narcotic use and commercialization. That in turn could result in the U.N. calling for commercial or other embargoes against them.